Starting this fall, I'll be teaching at the School of Political Studies at the University of Ottawa. It's an awesome job and a really great department for me, because it makes room for a bunch of those attributes that make me, shall we say, a quirky job candidate. First, I'm teaching American politics, which is where a lot of my research focus is--but I'm not an "Americanist" in the sense of having been trained specifically in the study of the US only/primarily. Luckily, since this job isn't in the US, it's a chance to work on American politics within a comparative politics framework, and that's not considered unusual. Second, the department is very interested in research that incorporates normative methods, ethnography, interpretive methods, and other modes of conducting research that are less-appreciated on this side of the border--so the fact that I do that sort of work isn't a downside. It's a big department, which means the fact that I don't fit narrowly into any of the subfield boxes is OK, since they can handle having some people who bounce around, which a department of six people can't. And, finally, it's a bilingual department, offering BA, MA, and PhDs in English and French, and requiring that all its faculty teach in both languages (at least sometimes). While my French certainly isn't up to teaching-standard yet, it's an exciting challenge, and one I'm looking forward to. 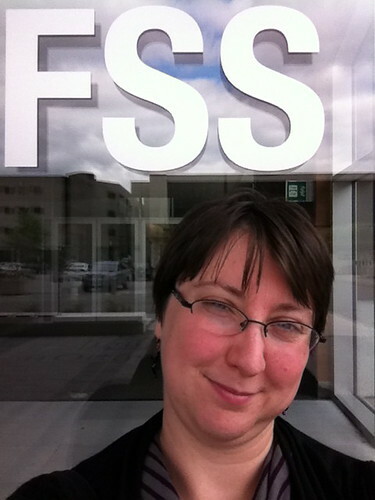 an iPhone selfie photo of me standing in front of the Faculté des Sciences Sociaux/Faculty of Social Science building, University of Ottawa, with the letters FSS over my shoulder. My family and I are gearing up to emigrate, which is both a huge production (we need a spreadsheet listing the exact contents of every box we're bringing, along with its estimated value in Canadian dollars) and not that awful (it's only 4 hours from where we live now to Ottawa, and US citizens with job offers have a remarkably easy time getting work visas). We've rented a house in the neighborhood of Westboro, and registered my son for senior kindergarten at a local school. In other news, holy crap, it's all real. 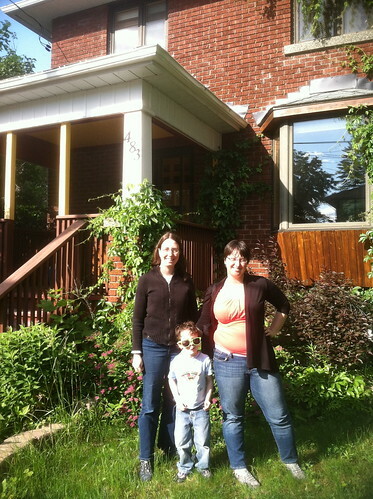 Me, my wife, and Mr. X, who is very large now, standing outside our new house. I'm standing weird because I sprained my ankle the day before--turns out two years away from urban living is not good for your walking-everywhere ability. 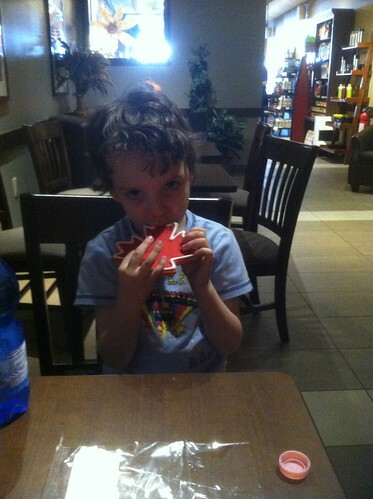 Mr. X, whose hair is quite hilarious, experiences culinary nationalism in the form of a maple leaf cookie. He's gotten very good at pointing out when he sees those "Canadian leaves" on everything. Is it possible to end this post without a Robin Sparkles gif? I don't think so.